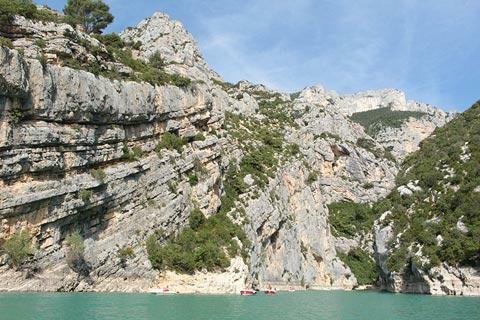 The Lac de Sainte-Croix is a leisure lake and reservoir within the Regional Natural Park of Verdon, created in 1974. There are various places of interest along the shores of the lake and in the immediate vicinity. France This Way comment: there are roads all the way around the Lac de Sainte-Croix, although these are often quite a distance from the lake so you can not always see the water. No problem because the countryside is also nice to see! The village of Les Salles-sur-Verdon, on the eastern shore of the lake, is also popular with visitors but is entirely new so has no historic interest: the village was built after 1974 to replace the historic village of the same name, that was destroyed at the time the dam and lake were created (the site of the original village was flooded as part of the project). 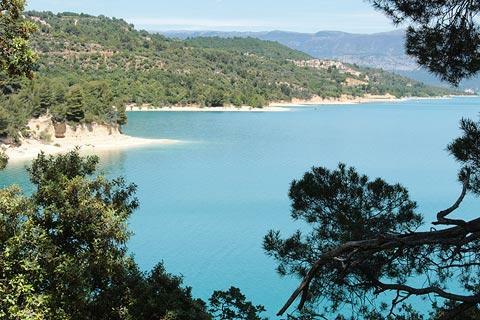 All three of these places have supervised beaches on the shores of the lake, with those at Sainte-Croix-du-Verdon and Les Salles-sur-Verdon being larger and with more parking than the beach at Bauduen which is almost in the centre of the village. 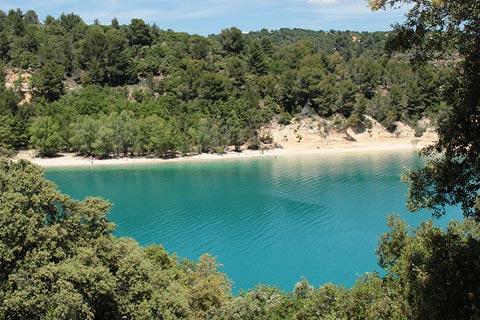 Although you can find small beaches elsewhere on Lac de Sainte-Croix these are not supervised and because of unpredictable currents in the water you are recommended by the local tourist offices to stay on these three beaches and the beaches near the Pont de Galetas. 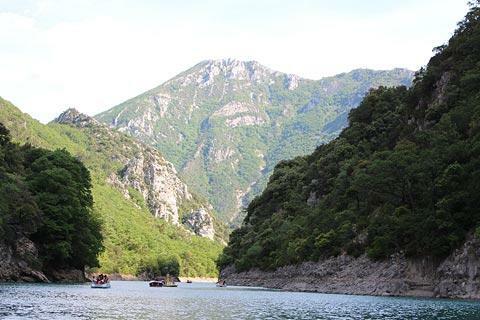 If you travel to the east end of the Lac de Sainte-Croix you can stop at the bridge where the Verdon river enters the lake, called the Pont de Galetas. 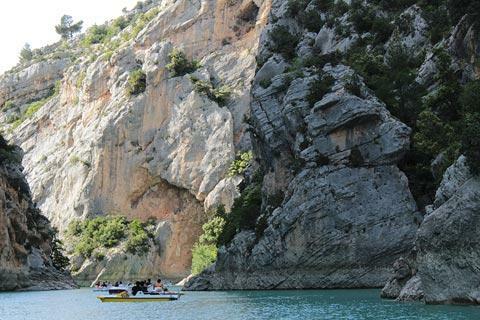 There is a beautiful view of the entrance to the Gorges du Verdon from here, and you can hire a canoe or pedalo to explore the gorges and this part of the lake as well as enjoy one of the small beaches on the lake shore. 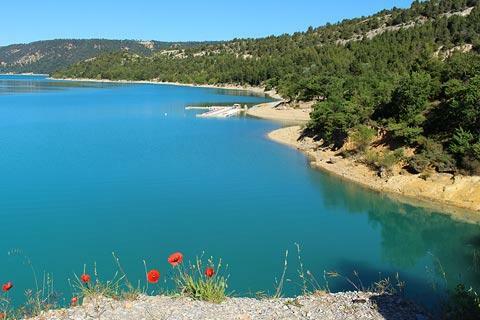 Another lovely view across the lake is from near here: follow the road towards Castellane on the northern edge of the gorges for a short distance to reach the Colle d'Olivier on the hill above the Pont de Galetas. 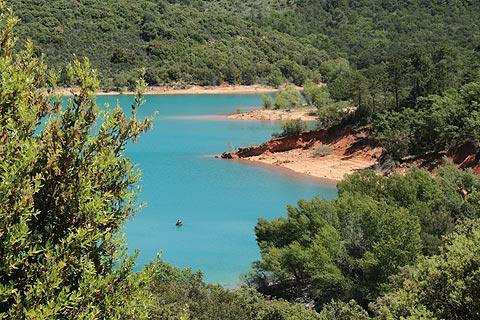 One village that is not on the shores of the lake but is close enough to be part of your tour of the Lac de Sainte-Croix is Moustiers-Sainte-Marie, a few kilometres to the north. From certain places in the village you have views that extend across the lake so I am allowed to include it here! The village is listed among the "most beautiful villages of France" and in a spectacular setting with cliffs behind the village as well as being very interesting and picturesque to visit: you might well find (as we did) that you need more time to explore Moustiers than all the other places around the lake put together! One more village you will want to visit that also has views across the lake is Aiguines, a few kilometres to the east of the lake. Aiguines is a small, traditional Provencal town with a castle and chapel among the sites of interest. 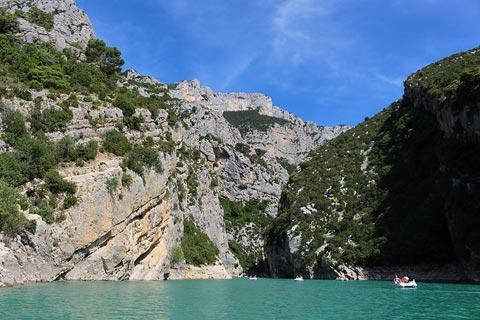 After you have explored around the Lac de Sainte-Croix you will certainly want to also explore the Gorges du Verdon, a very deep canyon to the east that brings the Verdon river to the lake. If you visit in June or July you can travel west on to the Valensole plateau to enjoy the beautiful lavender fields in flower.